The pharmacological and safety profile of Buprenorphine makes it an attractive treatment for patients addicted to opioids as well as for the medical professionals treating them. Buprenorphine is a partial agonist at the mu opioid receptor and an antagonist at the kappa receptor. It has very high affinity and low intrinsic activity at the mu receptor and will displace morphine, methadone, and other opioid full agonists from the receptor. Its partial agonist effects imbue Buprenorphine with several clinically desirable pharmacological properties: lower abuse potential, lower level of physical dependence (less withdrawal discomfort), a ceiling effect at higher doses, and greater safety in overdose compared with opioid full agonists. At analgesic doses, Buprenorphine is 20 times more potent an analgesic than morphine. Because of its low intrinsic activity at the mu receptor, however, at increasing doses, unlike a full opioid agonist, the agonist effects of Buprenorphine reach a maximum and do not continue to increase linearly with increasing doses of the drug – the ceiling effect. One consequence of the ceiling effect is that an overdose of Buprenorphine is less likely to cause fatal respiratory depression than is an overdose of a full mu opioid agonist. The limiting effect of euphoria. Because of the imperfect fit of the Buprenorphine and the receptor, there is a limit as to the opioid effect one receives. With most patients this occurs at about 12-16mg. As the dosage is increased beyond the ceiling no difference in euphoria will be felt. 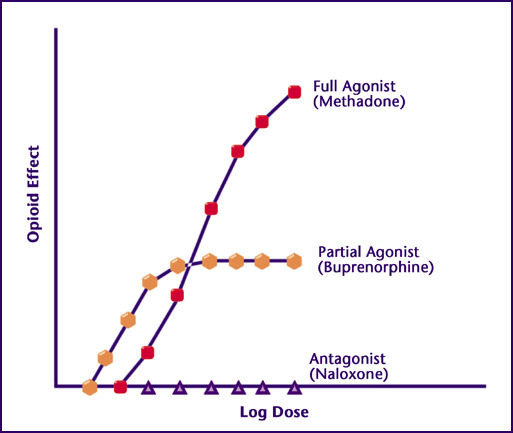 In the pharmacotherapy of opioid addiction, Buprenorphine, as a partial opioid agonist, can be thought of as occupying a midpoint between opioid full agonists (e.g., methadone, LAAM) and opioid antagonists (e.g., naltrexone, nalmefene). It has sufficient agonist properties such that individuals addicted to opioids perceive a reinforcing subjective effect from the medication, often described in terms of "feeling normal." In higher doses, and under certain circumstances, its antagonist properties can cause the precipitation of acute withdrawal if administered to an individual who is physically dependent on opioids and maintained on a sufficient dose of a full agonist. In this scenario, Buprenorphine can displace the full agonist from the mu receptors, yet not provide the equivalent degree of receptor activation, thereby leading to a net decrease in agonist effect and the onset of withdrawal. Furthermore, because of the high affinity of Buprenorphine for the opioid receptor, this precipitated abstinence syndrome may be difficult to reverse. Buprenorphine produces a blockade to subsequently administered opioid agonists in a dose-responsive manner. This effect makes the drug particularly appealing to well-motivated patients, as it provides an additional disincentive to continued opioid use. Buprenorphine has several pharmaceutical uses. It is a potent analgesic, available in many countries as a 0.3 0.4 mg sublingual tablet (Temgesic®). Until 2002, the only form of Buprenorphine approved and marketed in the United States was the parenteral form for treatment of pain (Buprenex®). In 2002, the FDA approved two sublingual tablet formulations of Buprenorphine as opioid addiction treatment medications: Buprenorphine alone (Subutex®) and a combination tablet containing Buprenorphine plus naloxone in a 4:1 ratio (Suboxone®). Both of these tablets are Schedule III opioids and therefore eligible for use in the treatment of opioid addiction under DATA 2000. Note that, as of the date of this publication, Subutex® and Suboxone® are the only forms of Buprenorphine that are indicated and can be legally used for the treatment of opioid addiction in the United States – neither Buprenex® nor its generic equivalent can be used legally to treat opioid addiction. Five topics related to the general pharmacology of opioids are reviewed in the first part of this chapter: (1) opioid receptors; (2) functions of opioids at receptors; (3) consequences of repeated administration and withdrawal of opioids; (4) the affinity, intrinsic activity, and dissociation of opioids from receptors; and (5) applied pharmacology of Buprenorphine. Opioid receptors are molecules on the surfaces of cells to which opioid compounds attach and through which they exert their effects. Different types of opioid receptors are present in the brain. The receptor most relevant to opioid abuse and treatment is the mu receptor. It is through activation of the mu receptor that opioids exert their analgesic, euphorigenic, and addictive effects. The roles of other types of opioid receptors in the brain (that is, non -mu opioid receptors) in the addictive process are not well defined. Drugs that activate receptors in the brain are termed agonists. Agonists bind to receptors and turn them on they produce an effect in the organism. Full mu opioid agonists activate mu receptors. Increasing doses of full agonists produce increasing effects until a maximum effect is reached or the receptor is fully activated. Opioids with the greatest abuse potential are full agonists (e.g., morphine, heroin, methadone, oxycodone, hydromorphone). Partial agonists possess some of the properties of both antagonists and full agonists. Partial agonists bind to receptors and activate them, but not to the same degree as do full agonists. At lower doses and in individuals who are not dependent on opioids, full agonists and partial agonists produce effects that are indistinguishable. As doses are increased, both full and partial agonists produce increasing effects. At a certain point, however, the increasing effects of partial agonists reach maximum levels and do not increase further, even if doses continue to raise – the ceiling effect. The figure represents any effect mediated by mu opioid receptors (e.g., analgesia, euphoria, respiratory depression). As higher doses are reached, partial agonists can act like antagonists – occupying receptors but not activating them (or only partially activating them), while at the same time displacing or blocking full agonists from receptors. Buprenorphine is an example of a mu opioid partial agonist, and its properties as such are discussed in detail below. The repeated administration of a mu opioid agonist results in tolerance and dose-dependent physical dependence. Tolerance is characterized by a decreased subjective and objective response to the same amount of opioids used over time or by the need to keep increasing the amount used to achieve the desired effect. In the case of abuse or addiction, the desired effect typically is euphoria. Physical dependence is manifested as a characteristic set of withdrawal signs and symptoms in response to reduction, cessation, or loss of the active compound at receptors (withdrawal syndrome). Typical signs and symptoms of the opioid withdrawal syndrome include diarrhea, yawning, hypersensitivity to any pain, cramps and aches, papillary dilation, and sweating. Not all of these signs and symptoms are necessarily present in any single individual experiencing the opioid withdrawal syndrome. Withdrawal, characterized by marked distress, may include drug craving and drug seeking and is frequently associated with relapse to drug use in a patient with opioid addiction. In an individual who otherwise is in good general health (e.g., with no history of significant cardiovascular disease), opioid withdrawal is not life threatening. In an individual who is physically dependent on heroin, spontaneous withdrawal usually begins 6 - 12 hours after the last dose and peaks in intensity 36 72 hours after the last use. The spontaneous withdrawal syndrome from heroin lasts approximately 5 days, although a milder, protracted withdrawal may last longer. Other short-acting opioids, such as oxycodone and hydrocodone, have kinetic profiles that are similar to heroin, and the time course of spontaneous withdrawal for these agents should be similar to that documented for heroin. Opioids with longer half-lives have a longer period before the onset of spontaneous withdrawal (e.g., 24-72 hours for methadone) and a longer period before peak withdrawal is experienced. Precipitated withdrawal also occurs in individuals who are physically dependent on mu agonist opioids. Precipitated withdrawal usually occurs when an individual physically dependent on opioids is administered an opioid antagonist. In an individual who is not physically dependent upon opioids, the acute administration of an antagonist typically produces no effects. In an individual who is physically dependent on opioids, however, an antagonist produces a syndrome of withdrawal that is qualitatively similar to that seen with spontaneous withdrawal (although the onset is faster and the syndrome is shorter, depending on the half-life of the antagonist). One way to conceptualize precipitated withdrawal is that the antagonist displaces agonists from receptors, but because the antagonist does not activate the receptor, there is a net decrease in agonist effect, resulting in withdrawal. In addition to variations in affinity and intrinsic activity, drugs also vary in their rate of dissociation from receptors. Dissociation is a measure of the disengagement or uncoupling of the drug from the receptor. Dissociation is not the same as affinity – a drug can have high affinity for a receptor (it is difficult to displace it from the receptor with another drug once the first drug is present), but it still dissociates or uncouples from the receptor with some regularity. The slow dissociation of Buprenorphine contributes to its long duration of action.